This is only an announcement of the upcoming release (tomorrow together with ReShade Beta 0.19.0, if Crosire is available) going very brief over the features of the new ReShade Framework Mediator. I hoped for a release today so I at least want to give you the following information. Yes, it is basically finished, that is why I can already tell you what features it will contain. First of all, big thanks to Ioxa for his great work with the changes to the configuration files and to Crosire who took his time to support Symlinks with ReShade 0.19.0. Have a good night guys and again thanks to everyone involved. This looks incredibly awsome. Great Job Guys! Really looking forward to use this i can't wait. Looking forward to this! Anxiously! That does look great. Fantastic stuff as always Lucifer. @LuciferHawk: first a big thanks and well deserved gratitude for all your work you have done in Framework Shaders & Mediator! Im using your shaders for a time now, first your GEMFX standalone mod (outside ReShade, v1.08 - www.twcenter.net/forums/showthread.php?6...-GEMFX-Version-1-0-8) & now the new ReShade Framework Mediator --> awesome & very handy! Even old games can look phenomenal with all these shaders! My fav shader? Definately your Ambient Light shader, now this brings me to this question: are you still working on the Natural Light shader & when can we see it? Is it possible to have the Anamflares vertical positioned instead of horizontal and is it possible to add negative values for some shaders into the Mediator, for example the Levels shader: I used negative values (to compensate too dark areas); of course I could manually edit those values outside the Mediator but when I swap back to use the the Mediator at a later time, the Mediator doesnt read/ recognise these manually changed values. The performance is very good while using the shaders in most games although when I use this (especially the GEMFX shaders) the framerate dives from 60 to 30fps in Assassin's Creed IV: Black Flag, especially the Ambient Light & Motion Blur shaders causing this, the others shaders like SweetFX etc, doesnt have this fps impact in Black Flag (besides the SweetFX SMAA shader which causes a fps drop too). I dont have a clue whats causing this. Is it possible to make the layout of your Mediator bigger, all values are sitting very close to each other, its easy to make a mistake this way, while changing values on the fly. Is there a way to dynamically limit the bloom output, while using the same settings, for example night time in Black Flag could use more bloom than during full bright daylight. When I ported the configs to the Mediator I used the bounds that were listed in the configs, but I know people use values that are outside of the recommended bounds, like negative values for lumasharpen, I just didn't know what kind of values people used. Some of the configs didn't even have any recommended bounds so I just had to guess at what they were. So let us know if you come across any other shaders that don't let you use the same settings you've used in the past so the bounds can be adjusted. -255 might be more than you need so you can make that number smaller and it will be a little easier to adjust in the mediator. Just be sure to either have the mediator closed when changing the config file or press the reset button in the mediator after making the changes to the config. - Specify a specific key for screenshotting the screen (vanilla, all effects off) into the Mediator. Those two preset comparison images you have now? Instead of just two, how about its a list of thumbails that starts with that vanilla shot and then another image for each saved preset for that game applied to the shot so that you can get a quick comparison at a glance. Clicking on each of the thumbnails should display the full res version of the image. 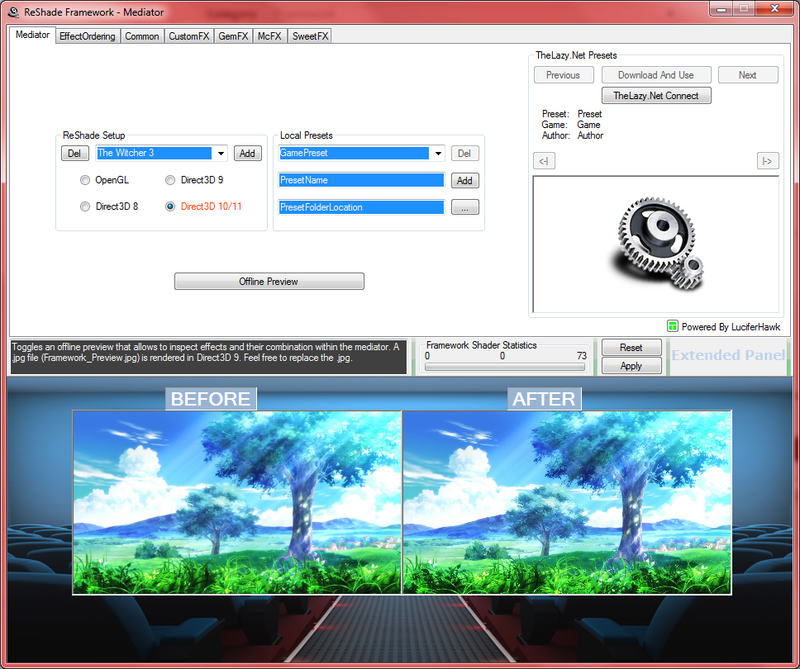 - A comparison tool with several settings for comparing two presets. From the list of thumbnails I just mentioned, being able to highlight two of them and then have several options for comparing the full res image of both: options like the sliding comparison tool like from sfx.thelazy, the transition on mouseover from screenshotcomparison.com, side by side, etc. - When loading a preset, display the preset name in a label. If the user makes changes to any of the preset settings, put an asterisk at the end of the title signifying pending changes to be saved. Add 'Save' and 'Save As' menu buttons for overwriting or creating new presets. When a user switches presets but has pending changes for their current preset, use a messagebox to prompt them whether or not they want to save changes. Do the same when the user has pending changes and goes to exit the application. Finally got around to playing with the Mediator. Some feedback! It can be quite hard dragging the slider to a particular value, particularly for those settings that have wide ranges. Suggestion: Add a text entry box at the end of every slider, so a value can be entered directly. So basically, you have two ways to set a setting: slider mode and direct entry mode. To help readability: for all settings boxes, add spacing after each setting name so that all sliders are aligned vertically with each other in the box. It will look clearer and cleaner to use. Naturally since different setting names have different lengths, this will be automatically determined by Mediator when it renders the box -- find the setting with the longest name, make that the start point for aligning the slider bars. A 'real-time' mode toggle: as soon as a value is adjusted, save it without the need to press Apply. Good for testing effects in real-time on a game, including being able to drag those sliders around to see the results (relatively) instantly. Other than this, so far so good! 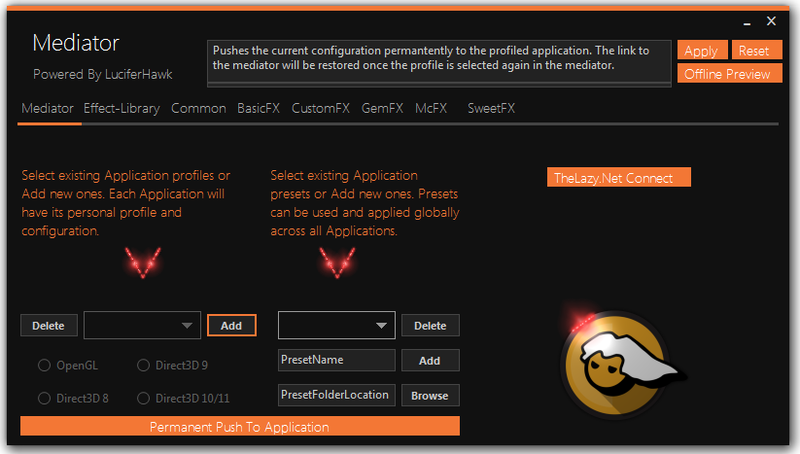 will it be possible to search and download presets from sfx.thelazy.net/ in the mediator software? because atm it is not working, i tried it with "The Witcher 3" and "Final Fantasy XIV" but it cant find anything, or am i supposed to do something before it will work? the window with the Presets? is empty after clicking "TheLazy.NET Connect". oh and on my 40" 1080p TV(i play in my living room) i cant really read, the font is way to small, would it be possible to give an option to make the font bigger? sorry for asking and sorry for my english. It is working but there have to be more people first to upload framework/mediator compatible presets. So presets that have been created in the mediator. Thanks Ioxa, your method works great! By the way your High Pass Sharpening / Contrast Enhancement & Color Filter shaders are very good, I use them for some time now, are you planning to make some more shaders? CA [Chromatic Aberration] in the standard SweetFX_settings [CA] and the other one in McFX_settings [FishEyeCA] doesnt look that good to be honest, is it possible you could make your own CA shader, a better one? Anyway thanks again for your special shaders!! Thanks, glad you like them! What do you not like about those CA shaders and what would you like to see different? I'm not very good at coding but I could try to come up with something. Nice work, hope its easier to add new effects now. Also (asked this also on steam, sorry for beign a bit anxious and insistent), but are there any news on that retina shader? Loves to test stuff for no reason. Looking good Lucifer! The LUT generator is going to be a great addition! Your new layout looks definitely better LuciferHawk! The burning question: when will you release yr new Mediator?